Premium squid steaks are scored and sliced into strips before being tumble dusted in a crispy flour coating. This gives our calamari a tender bite, unique curl, and offers a great plate appearance. 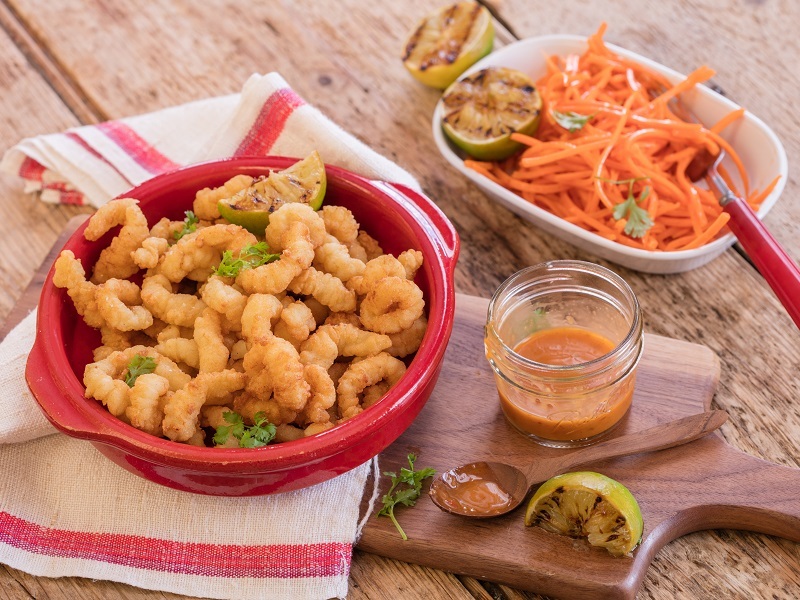 Mrs. Friday’s® Twisted Calamari is easy to prepare and has an impressive back of house look. Try this new twist on a popular menu item with your favorite sauce! Do Not Thaw * Do Not Overcook. Fry in clean oil at 350°F/176.667°C for 1 ¼ - 1 ½ minutes. Calamari, Bleached Wheat Flour, Enriched Bleached Wheat Flour (Wheat Flour, Niacin, Reduced Iron, Thiamine Mononitrate, Riboflavin, Folic Acid), Yellow Corn Flour, Water, Salt, Cottonseed And/Or Soybean Oil, Modified Corn Starch, Whey, Wheat Gluten, Whey Protein Concentrate, Corn Syrup Solids, Dried Whole Eggs, Dried Egg Whites, Leavening(Sodium Aluminum Phosphate, Sodium Acid Pyrophosphate, Sodium Bicarbonate), Spice Extractive, Garlic Powder, Onion Powder, Flavor(Maltodextrin, Gum Acacia, Natural Flavor, Silicon Dioxide), Spices, Citric Acid, Sodium Citrate (Color Retention).Contains:Wheat,Egg,Milk.